Maintaining optimum performance of your car is imperative in ensuring a comfortable experience as well as a certain level of safety. One of the most used features in any car are its headlights. Ever since the replacement of glass headlights with those made out of polycarbonate, one of the biggest challenges that car owners face is that of oxidation. While the switch from glass to plastic was made for reasons of cost-effectiveness and durability, the yellow lining that these plastics develop over time affect the effectiveness of the lights as well as night-time visibility. Headlights usually become dull, scratched and develop a yellow lining after excessive use. Some headlights are severely affected more than others, usually based on the length of use. As this impairs visibility and safety while driving, one would think they might have to make the expensive trip to the car servicing station. However, things are much easier when you can find some professional and highly effective headlight restoration kits online. They are quite inexpensive and make for a really good fix. The product that suits your needs best might be dependent on the severity of the damage. Read through this buying guide and reviews of some of the best headlight restoration kits available online. Specific products are suggested based on the severity of the discoloration or the scratches. If the plastic itself is still pretty clear and does not require extreme intervention, you might not need the most sophisticated of kits. If the scratches are small and not too deep, a basic polish and cleaning might be enough. However, if the headlights are severely damaged and impair the clarity of the lights at night, then you might even be safe going for the drill-based headlight restoration kits which are more sophisticated and heavy duty than the normal kits. Therefore, make your decision based on the severity. Top manufacturers are coming out with large varieties of kits for different purposes. A basic review of the choices available online will elicit the variety and functionality of all the products available and help you determine the ideal choice for your needs. Having a basic idea of what you need before doing this search will help you filter out the unnecessary options and focus on those that are the most relevant to your needs. Once you know the type of product required as well as the range of products available, you can narrow your choices down based on product reviews as well as price. Most leading manufacturers have different products for different requirements and are priced accordingly. Deals on these products also keep appearing online. So keep an eye out for your product. This professional-grade 3M product is highly effective in removing yellow lining on headlights, tail lights and fog lights. 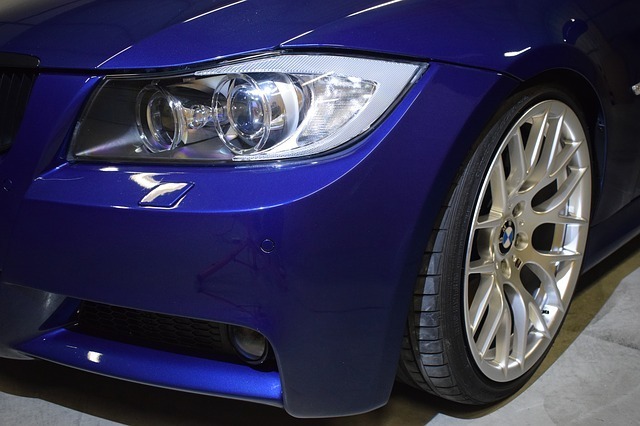 It uses light abrasives, polishes and protectants that makes the headlight almost feel like brand new. It removes all sorts of stains and polishes the surface to get rid of scratches. The packet includes masking tapes, light sanding discs, abrasive discs, a 3M backing plate as well as a foam compounding pad. Includes all instruments required for simple or complex repairs to your headlights. Option of using drill-based equipment or simple polishing equipment to accommodate all types of repairs. Easy-to-follow instructions provided by the manufacturer are included within the packet. Affordable for the variety of purposes that this kit serves. The packaging does not come with a sealant which might be required based on the operation you are undertaking for your headlight. A singular foaming pad might be seen as an inconvenience by some as it is to be used on at least 2 headlights and even other lights on the car. Some picky customers also complain that the package does not consist of a microfiber cloth. Not that big a deal, but you will have to arrange for one separately. This headlight restoration kit is certainly a bestseller for the right reasons. It satisfies a variety of requirements that range from the simplest of fixes to a whole makeover of your headlight. It comes with a comprehensive set of instructions that makes it easy to use. It also comes at quite an affordable price for the range of functions it satisfies, therefore making it a very handy addition to anybody’s toolkit. 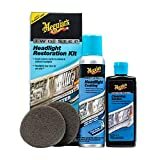 This one has been a very commonly used headlight restoration kit thanks to its quick and easy usage coupled with the lifetime warranty that comes with the kit. This places it above many other competing products and customers generally also prefer its effectiveness over other products. It works best to restore headlights when they have become hazy and discolored largely due to the UV exposure through the sun. The kit comes with sandpaper, microfiber cloth, cleaning liquid, gloves, a polishing compound, a clear coat compound as well as a masking tape. Easy to use and highly simple directions. Lifetime warranty on the product makes it highly reliable. Three-step process does not take very long to follow. Some suggest that the adhesive tape does not keep the surrounding areas dry. The entire process takes longer than the advertised 35 minutes. 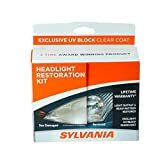 The Sylvania headlight restoration kit might be the best bet when it comes to durability and reliability of a product. While many people like to go all in with their drills and foam pads, the effectiveness of this product is as high as it can get. It comes with a UV clear coat compound that many other products don’t include. All in all, this offers one of the most user-friendly, cost-effective and durable fixes to all your headlight problems. 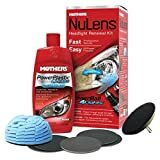 This kit is an all-in-one headlight renewal kit that works on the yellowing of the plastic and also buffs out hairline scratches along its surface. It includes a special PowerBall polishing tool that works better than most in the market to buff out scratches and remove stains. While it requires additional tools, it is also less time-consuming owing to the power drill based system that works faster than manual polishing. It includes a PowerBall polishing tool, a PowerPlastic liquid polish, a backing plate and restoration discs. Very easy to use thanks to the power drill system. The time taken is also considerably lower than with other products to achieve the same results. The special PowerPlastic polish helps to protect against oxidation in the future. It requires the use of external tools like a power drill which many might not have access to. Some suggest that it requires more than one grit pad which is used for polishing the headlights. Many suggest that this straightforward product is easy to use and requires minimal instruction to follow due to its simplicity. It has also been in the market for a while and has received positive reviews for the most part. If you are looking for a no-nonsense quick fix to your headlight problems and have a power drill handy, this is a very good product to invest in. 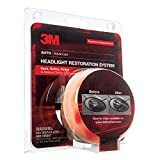 Another one of 3M’s all-purpose headlight restoration kits, this heavy duty product can be used on headlights, taillights, fog and directional lights. The kit comes with sanding discs, polishing pads, a cleaning compound as well as a protectant. It requires the use of a power drill for sanding the headlight. The manufacturer gives a five-step instruction that takes approximately an hour to complete. Comprehensive instructions provided make this product easy to use. It generally takes approximately an hour to complete the job, which is not too long. While it may appear that the lens face is not smooth at the outset, the final outcome will show how effective the five-step process is. This also requires a drill to operate. This may not offer the extended UV protection that some other products in the same line offer. This restoration kit has time and again proven to be one of the more reliable products for those who are performing such a task for the first time. The easy to follow instructions and effective results usually leave the buyer satisfied and happy with the product. This two-step restoration kit is one of the easiest to use in the market while maintaining a solid coat on your lens for over 12 months. The first step includes a thorough cleanup and the next is that of applying a special coating on your lens which leaves it crystal clear and also protects it against oxidation in the future. Extremely easy to use with least possible time consumed. All this while maintaining a high standard of results. No need for any drills or external tools. It can polish every light on your car. This product does not come with any warranty but still assures an effect that lasts for 12 months. You might not be able to use the car for up to 24 hours in order for the coating to dry (depending on the weather). This is one of the most used products largely due to its simple two-step process. It also promises results that sustain for over a year, and can be used for up to six pairs of lights on your car based on the amount of wear. The manual application also allows for greater accuracy while this specific product does not even take that long to use. Therefore, it makes a very easy-to-use and effective product overall. So here are five of the most used headlight restoration kits that encompass the entire range of requirements. Some might need a two-step quick fix while others might need a heavy duty repair. Whatever your needs, these products will suffice all of them!